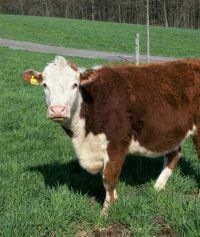 Our herd of friendly Certified Organic 100% Grassfed Jersey cows produces rich, flavorful, creamy milk. Because it is easier on the cows, as well as the boys who milk them, we have chosen to milk our herd only once a day. The total gallons of milk produced is lower, but the nutrient content of the milk, and the butterfat and milk solids are higher. This is important to the flavor, and provides a higher yield for Jared, our cheesemaker, who turns surplus milk into a wide variety of cheeses. He also makes yogurt, kefir, labneh, and butter; and seasonal treats like pumpkin spice yogurt, and eggnog. Order for pickup at a drop, Farmers Market or at the farm here, or order cheese to be shipped to you here! We have also chosen to keep our herd 100% Grassfed. During the summer they roam the pastures munching specially chosen grasses and legumes; in the winter they eat the hay which our hard working team of boys harvested and stored for them. Studies show that 100% Grassfed milk has higher omega 3 and CLA, as well as multiple other health benefits. It is also more easily digested, and can often be consumed by folks who thought they were lactose intolerant. Check out EatWild.com for lots more detail, and study results, or google 100% Grassfed.